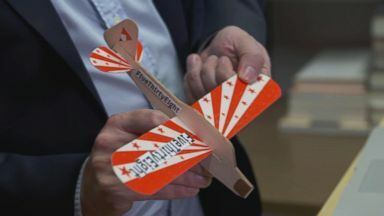 "Nightline" takes a look at the biggest headlines from election night. Millions of Americans turning out to vote in what has been perhaps the hardest-fought, certainly the most-expensive midterm elections ever. 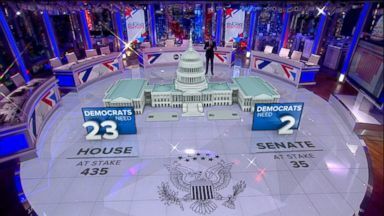 The results in the battle for control of congress, Democrats taking the house of representatives, surpassing the 23 seats needed to seize control and flip the majority. In the senate, however, a very different story. Republicans holding on to power, even picking up seats. President trump claiming victory via tweet, of course. Quote, tremendous success tonight, thank you to all. However, exit poll numbers from "Today" show a majority of voters disapprove of his job performance. And most people who went to the polls say they oppose the president. And interestingly, when voters were asked what is the most important issue, health care came in at number one. Way ahead of immigration. The issue the president chose to highlight in the closing days of this campaign. So much to talk about. So let's get straight to some very smart people. ABC news senior national correspondent Terry Moran, our political director Rick Kline, cokie Roberts, political analyst for ABC news. Good evening to all of you, or good morning. Whatever it is. Depending how you're looking at things. Democrats took the house. What does that mean for president trump starting right now? Trouble. He's got a whole new world in front of him, a world of committee chairmen who will have the power of subpoena and will maybe come after his tax returns, his family organization, business records. And also a very different world on policy. There's no more Republican trump agenda that's going to get through the congress. Nothing might get through the congress. So it's going to be a much more difficult presidency for him and one that he will have to probably adjust to in some form or fashion, suggesting he'll change his tone. I'll believe when it I see it. Cokie, do you believe that? That he'll change his tone? Yes, or that he can navigate this -- I think he probably can do some navigation. I think he naturally enjoys the company of Nancy Pelosi more than that of Paul Ryan. A boy scout from Wisconsin versus a signed pol originally from Baltimore and San Francisco. Just for the uninitiated, Paul Ryan, current speaker of the house, Nancy Pelosi, the once and perhaps future speaker of the house. Right. I think things like infrastructure that the president talked about in the campaign, the Democrats have been dying to do. Used to be always a bipartisan bill. Hasn't been in recent times but it might be again. There might be some things that can happen. Look, we've got a bunch of interesting things going on in the house. And they might contribute to more cooperation than we think. All these veterans, you know, veterans, we talked about it earlier, Dan, veterans care about the country, work together, and might be working together in the house of representatives. We've got a lot of veterans elected to office tonight. Rick, let me ask you, if this was a referendum on the president, what were the results of that referendum? Yes, and no. It was a little bit of everything. You could look at this election any bay way you want to slice and it find plenty to love about what happened and plenty to hate, a perfect enhance latin of our politics. Maybe all of the contradictions of president trump. You can have one country on one night vote in entirely different directions. To ratify the trump agenda in red states, a number of states that were key to his voting coalition two years ago, to reject it in other states. In suburban centers, you can go outside of Washington, New York, Chicago, Dallas, Houston, Oklahoma City, Kansas City, los Angeles, and you find these little red spots that are now turning toward the blue. And president trump was very much repudiated in those places. It is this contradiction, I think, that's going to define this election. Cheered and chastened. Depending on where you sit, everybody is cheered and chastened. Look at the governors races, very important. We just decided at ABC news Wisconsin has gone democratic, Michigan has gone Democrat irk, Illinois, Nevada democratic -- States that handed Donald J. Trump the presidency. Exactly. Kansas as well. Kansas, now that was aberrant for various reasons. But still, quite remarkable. In some way dozen we start where we began? We're moving chips around on the board. We started with a divided Kun true, and here we are again. Divided not necessarily politically. It's this cultural division between us. Between those of us who live in certain places and look at life a certain way, and those of us in other places. Rural and suburban. And between men and women. A big, big difference between the way women voted and the way men voted. We now have all these women in congress. When my mother was elected in the special election in 1973 to congress, she became the 16th woman in congress. She joined 15 other women in congress. Now we will have more than 100. That is quite something. And another optimistic note, women do tend to work together better than the men do. So that's what I was going to ask about. There is data to show that women govern and legislate differently. They do. They tend to be -- obviously not every woman. But they tend to be less idealogical, more pragmatic, more willing to cross party lines, particularly on issues that have to do with women, children, families, but on all kinds of things. You saw the government shutdown, the most recent one, women in the senate came together and said, for god's sake, let us not play stupid games. You see a lot of that. We know issues that brought people out, health care, immigration, gun control, the economy. How are these issues going to be dealt with or will these issues be dealt with in any way going forward? Start with immigration. There's a chance of a showdown before the Democrats take over. You could have a government shut down if the president pushes his case for his border wall. He's talking about the caravan. Troops are still at the border to greet the migrant caravan. I think health care, though, is something -- it was the dominant theme of advertising. It was the thing that candidates were asked about more than anything else. And the parties are not just opposed, the president is trying to pursue a lawsuit that would get Obamacare thrown out entirely. The patch they'd have to put together for pre-existing conditions, that might be one of those areas, where as cokie mentions, they're going to have to work together. Referenda in the states, extended medicaid, you have the voters speaking as well. That's right. Thank you all, really appreciate it. Good to be with you. Tonight was a night of many firsts. For a look at some who made history in these elections, horse my "Nightline" coanchor Byron Pitts. Reporter: A pink wave of candidates. Has now become a record number of women heading to Washington. Many of them Democrats. Among them several veterans. Including former Navy pilot and federal prosecutor Mikey sharrow in New Jersey. It's a simple truth that we love our country. Reporter: Women racking up the score of other firsts along the way. Iowa and New York will be sending the youngest women elected to congress. At age 29. Michigan and Minnesota electing the first two Muslim women to the house. From Kansas and New Mexico, the first two native American women to serve in congress. For "Nightline," I'm Byron Pitts in New York. Behind-the-scenes look at ABC News' election coverage. Check in now with FiveThirtyEight.com to see the changing Midterm Vote Forecast - handicapping the numbers - the odds - of where The Vote is heading as the numbers shift minute to minute. 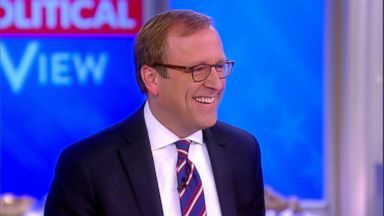 The ABC News chief white house correspondent gives the latest on the midterm races and how Trump's campaigning will affect them. 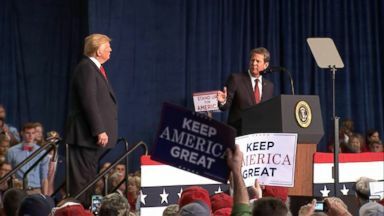 ABC News' Jon Karl and Mary Bruce report on what could happen if Democrats win control of the U.S. House and what the midterms' outcome could mean for Trump.